1 Oh give thanks to the LORD, call upon His name; Make known His deeds among the peoples. 2 Sing to Him, sing praises to Him; Speak of all His wonders. 3 Glory in His holy name; Let the heart of those who seek the LORD be glad. 4 Seek the LORD and His strength; Seek His face continually. 5 Remember His wonders which He has done, His marvels and the judgments uttered by His mouth, 6 O seed of Abraham, His servant, O sons of Jacob, His chosen ones! 7 He is the LORD our God; His judgments are in all the earth. 8 He has remembered His covenant forever, The word which He commanded to a thousand generations, 9 The covenant which He made with Abraham, And His oath to Isaac. 10 Then He confirmed it to Jacob for a statute, To Israel as an everlasting covenant, 11 Saying, "To you I will give the land of Canaan As the portion of your inheritance." The first thing that jumps right at you in this passage is who is in the centre of attention: It is the Lord! Praise Him! Call upon His name! Worship Him! - is what we hear about His person. And then it is focused further on His works and abilities: Make known His deeds among the peoples. Speak of all His wonders. Glory in His holy name! Seek the LORD and His strength! Seek His face continually. Remember His wonders which He has done, His marvels and the judgments uttered by His mouth! Where are we in all this? It’s a challenge to us: Look to the Lord! Seek Him! That is also what Paul preaches about: “Where is boasting then? It is excluded.” Excluded! It’s not even being considered! Excluded! Which means: Shut out! And then he continues in the same verse: “- by what kind of law? Of works? No, but by a law of faith.” (Rom.3:27). How does faith arise in your heart? By focusing your eyes on Jesus and His works for you! So, faith is a gift, presented to you by a revelation of the Lord and His works! You are allowed to sit down on something someone else has done for you! He has worked - He has finished the work – and you get the rest that follows! Is that something to boast you about? No, that’s exactly what the apostle is preaching about: Your boasting is excluded! That’s why we preach Jesus, friends – so that the one, who toils and has much to carry, shall find the rest. And then we might see somebody in the church who sneaks in on a different terms – they don’t have any need to rest, because they have never been sinners for God. They have never toiled and worried under the commandments of the law, in battle with their sin. They have never experienced to fall into the same sin over and over again, even if they tried everything to stand. They have never experienced to have to cry like Paul: “Wretched man that I am! Who will set me free from the body of this death” (Rom.7:24). But listen to what I have to say now: We cannot avoid to give food out for those who hunger, because somebody might misuse it! It’s really not our responsibility! That’s the responsibility that those who misuse it have! Completely their own! And listen to how they do – because the Scripture has revealed it: “Go therefore to the main highways, and as many as you find there, invite to the wedding feast” Do you see? As many as you find! As many! It wasn’t the servant’s task to find the worthiness of those they met – but the message they got was: “Those slaves went out into the streets and gathered together all they found, both evil and good; and the wedding hall was filled with dinner guests. "But when the king came in to look over the dinner guests, he saw a man there who was not dressed in wedding clothes, and he said to him, 'Friend, how did you come in here without wedding clothes?' And the man was speechless. "Then the king said to the servants, 'Bind him hand and foot, and throw him into the outer darkness; in that place there will be weeping and gnashing of teeth.” (Matt.22:9-13). What kind of wedding clothes is he talking about here? It’s the purification by the blood of the Lamb! It’s about the refuge in Jesus and His works! There are probably people who can assume the doctrine of Jesus reconciliation – but it is completely different to take your refuge to it. Only God alone knows them! Indeed, we meet people on our way that we immediately connect with spiritually – and others that we find difficult to get in touch with, but we have to leave the final judgment to the Lord. But you who have taken your refuge in Jesus, the Lamb of God, you probably notice that those you connect with that are those who have all their attention towards Him, when it comes to the question about salvation, spiritual life, minister for the Lord and what else you might think of in this connection. They expect everything from Him alone! That’s God’s people on earth! They feel as one with this psalmist who has written this passage here. Another thing he points at is the covenant! The covenant that God made with Abraham. The one that have been given us in his descendants – which means: Jesus! It came 430 years before the covenant of the law! (Gal.3:17). It is described as an eternal covenant! (v.11). And then not just Israel as the certain Jewish people, but Israel as the children of Abraham - consisting of both Jews and heathens. Abraham isn’t just described as the forefather for the Jewish people, but also as the father of the believers – and when the Lord speaks about Abrahams blessings, it says: “And in you all the families of the earth will be blessed” (Gen.12:3). Paul elaborate this to the Galatians and writes this: “Christ redeemed us from the curse of the Law, having become a curse for us--for it is written, "CURSED IS EVERYONE WHO HANGS ON A TREE" in order that in Christ Jesus the blessing of Abraham might come to the Gentiles, so that we would receive the promise of the Spirit through faith”. (Gal.3:13-14). This eternal covenant of God – the one He always remembers – it is for you who are sitting here right now! Or if you would rather have the covenant that was given 430 years later – the covenant of the law – and try to justify yourself by works of the law! God tells you that you are a helplessly lost sinner that under no circumstances can become holy, good and just. Let us just mention a few places that describes this clearly: “Can the Ethiopian change his skin Or the leopard his spots? Then you also can do good Who are accustomed to doing evil.” (Jer.13:23). Doesn’t this seem pretty hopeless? And then: “The heart is more deceitful than all else And is desperately sick; Who can understand it?” (Jer.17:9). “It can't be healed.” (Norw. transl.) That's the word of God! Do you still want to try it? Well, then you just point exactly to the law – be my guest, now you have the possibility to justify yourself! Now you have a shot at trying to contradict what the Word of God is teaching about you! The fulfillment of the law is love! Then look at Jesus – His road of suffering through this world, to the death of the cross before His enemies. 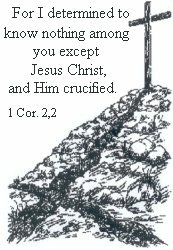 He prayed from His heart for those who crucified Him! You could start there! But hear about those who have gone into the ground of the new covenant – the covenant of Jesus body and blood – that which was given us and poured out for us for forgiveness of sins: “Glory in His holy name; Let the heart of those who seek the LORD be glad.” (v.3). That’s what God wants with you – that you should have joy in your heart! That’s also what Jesus talks about, right! He talks about it like this: “These things I have spoken to you so that My joy may be in you, and that your joy may be made full.”(John 15:11). “Until now you have asked for nothing in My name; ask and you will receive, so that your joy may be made full.” (John 16:24). “But now I come to You; and these things I speak in the world so that they may have My joy made full in themselves.” (John 17:13). Again and again the same wish – not just that they would have joy, but that their joy might be made full! His own joy! And this is also how He talks about His peace – what He gives to those who take their refuge in Him! We grieve over our sin – it makes us sad – and we grieve over the condition we can see in the world, but we do not for sure grieve with our eyes fixed on Jesus! With the thought of what we own in Him – on the safe foundation of the Word! “Seek the LORD and His strength; Seek His face continually.” (v.4).